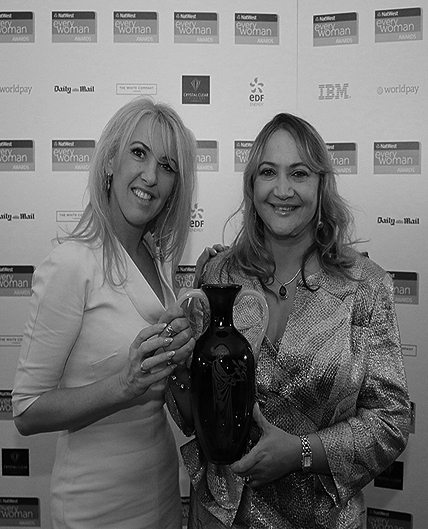 It’s been a whole year since Karen was crowned the Woman of the Year at the 2014 Natwest Every Woman Awards. Yesterday she returned to the icon London’s Dorchester Hotel, to support and help celebrate this year’s finalists, and hand over her award to this year’s Woman of the Year. Karen handed over her award to Ayesha Vardag, founder of London-based law firm VARDAGS, after giving an inspirational speech about how grateful she was to have won the coveted award last year, and what winning the award meant for her and her businesses. Over the past year Karen was pleased to report an increase in employees of 28%, taking her quota up to 230 members of staff across her business, which includes the following brands; Karen Betts Professional, HD Brows, Nouveau Lashes, Nouveau Contour UK and Skin Therapy. She also confirmed a phenomenal 46% growth of the business in the last year, and accredits this to the hard work and dedication of her employees who believe in the businesses, and also place great emphasis in offering the best possible customer service to all clients. Karen was honoured to be part of the awards once again this year, which help celebrate and advance women entrepreneurs. Karen said; “I feel extremely privileged to be amongst successful business women, who continue to work extremely hard day in, day out and never give up on making their dream come true.